Sometimes when I am running laps around an oval track I get mystified and I lose track of what lap I'm on. I am experiencing a similar phenomenon as I get further into my tetrajet project. I have studied this shape so much that I have absolutely no idea what it looks like. I will just pass off any design inaccuracies as artistic license, although sometimes I think the design as presented in the cartoon is the cel animated equivalent of an M.C. Escher painting. Holy crap I swear some of the aspects of this shape delve into impossible object territory. However I am getting closer and I made a Flickr album of some in-progress pictures of what I've got so far. The last two weekends have been nothing but sculpting, sculpting, sculpting. Well, except for last weekend when Richard gave me the heads up on the Star Wars marathon on Spike TV and I lost 3 days of productivity watching R2-D2's adventures in pan-n-scan with bonus commercials. The sculpt is coming out pretty good despite my artistic licenses which should have been revoked a long time ago by the artistic police. I'm still not at the final sculpt yet but I'm really close. This one is almost Colonial Viper-ish. Which makes it twice as sweet. Yeah! I was thinking the exact same thing. 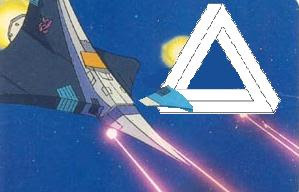 The design even in the very early stages reminded me of the Colonial Viper. I wonder if Dery was influenced at all by the Battlestar Galactica ships because Bumblebee's pre-Earth mode almost resembles a Cylon Raider. It could just be a coincidence. I also think the form is vaguely reminiscent of Luke's T-16 skyhopper but that didn't get much airtime so I doubt Dery knew much about that one. The Viper influence is really strong and only now I realize what Dery meant when he said the tetrajets needed to be stretched out. They're supposed to look like Vipers instead of pyramids. Well... they still look fantastic. Wets my pants,,pitch me an email to talk about this,as there still thing i'd like to know.